A solid education is vital to the success of every student, and an education that includes an emphasis on sustainability is vital to the success of our Earth, especially for future generations. Schools are important institutions, but they can have significant environmental impacts. For instance, every student generates an average of 240 pounds of waste every academic year. The 95,000 public schools in the United States spend $7.5 billion annually on energy – more than text books and computers combined. This year, do your part to reduce the ecological effects of back to school season, and send your children to class to make the grade not only academically but environmentally as well. When you receive your school supply list, conduct an inventory of the supplies you already have and buy only what you need. Organize a supply swap with friends and family to reuse excess supplies as much as possible. 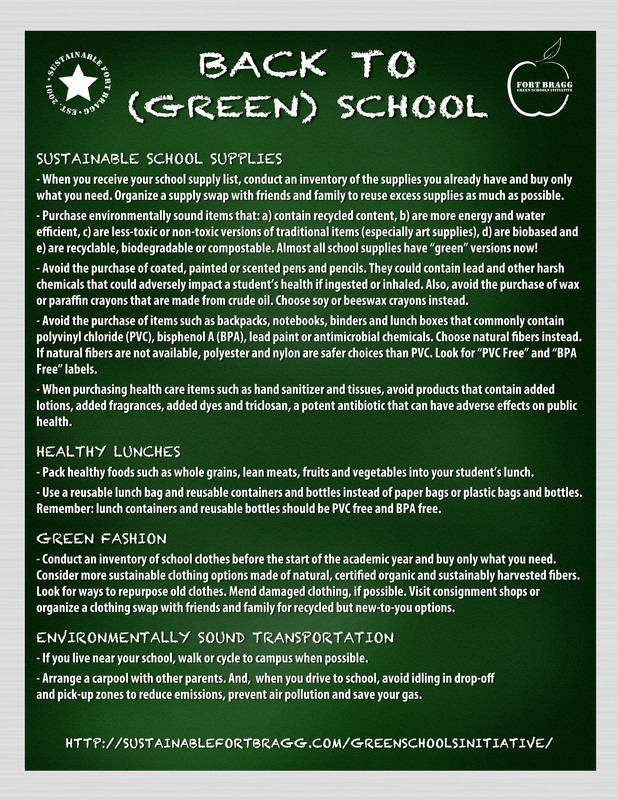 When shopping for school supplies, purchase environmentally sound products. Greener products have certain characteristics. They are more energy and water efficient. They are less-toxic or non-toxic versions of traditional items. They are recyclable, biodegradable or compostable. Avoid the purchase of coated, painted or scented pens and pencils. They could contain lead and other harsh chemicals that could adversely impact student health if ingested or inhaled. Also, avoid the purchase of wax or paraffin crayons. They are created with crude oil. Choose soy or beeswax crayons instead. Choose water-based paints and art supplies. Avoid the purchase of items such as backpacks, notebooks, binders and lunch boxes that commonly contain polyvinyl chloride (PVC), bisphenol A (BPA), lead paint or antimicrobial chemicals. Choose natural fibers instead. In natural fibers are not available, polyester and nylon are safer choices than PVC. Look for PVC Free and BPA Free labels. When purchasing health care items such as hand sanitizer and tissues, avoid products that contain added lotions, added fragrances, added dyes and triclosan, a potent antibiotic that can have adverse effects on public health. Recycle as much as possible, especially paper. Find inventive ways to repurpose waste. For instance, use recyclables in art projects. Pack healthy foods such as whole grains, lean meats, fruits and vegetables for lunch. Reduce waste in the cafeteria by carrying a reusable lunch bag and reusable containers instead of paper bags and plastic bags. Green does not have to be just a color in your wardrobe this year. Conduct an inventory of school clothes before the start of the academic year and buy only what you need. Consider more sustainable clothing options made of natural, certified organic and sustainably harvested fibers. Look for ways to repurpose old clothes. Mend damaged clothing, if possible. Visit consignment shops or organize a clothing swap with friends and family for recycled but new-to-you options. If you live near your school, walk or cycle to campus when possible. Arrange a carpool with other parents. And, when you drive to school, avoid idling in drop-off and pick-up zones to reduce emissions, prevent air pollution and save your gas. SELECT THE IMAGE FOR A PRINTABLE POSTER! Save energy for your school by encouraging students and fellow teachers to power down computers and other electronics at the end of the day, on weekends and during vacations, if possible. Use the power saver features on copy machines, printers and other electronic equipment. Encourage students and colleagues to “turn off the lights” in vacant rooms. Distribute and accept student assignments electronically when appropriate. Recycle as much as possible. Distribute information about the locations of recycling bins in your school, recycling procedures, sorting guidelines and such. Conduct regular training on recycling. Reduce waste by conducting regular inventories of supplies and ordering only necessities. Print documents double-sided to reduce paper waste. Purchase environmentally sound supplies and cleaning products to reduce waste, pollution and exposure to chemicals. Create a supply exchange program where students and fellow teachers can trade excess or unwanted school supplies. Include environmentally sound items on your school supply list, and encourage students and parents to consider the environment when purchasing school supplies. Find inventive ways to repurpose waste. For instance, use recyclables to create art projects. Distribute memos electronically or post them to shared networks or in a central location to reduce paper use. Encourage parents to walk or cycle to school with their children. Enforce a No Idle policy in student drop-off and pick-up zones. Encourage teachers and parents to participate in a Green Team and encourage students to develop a Green Club. Integrate green themes into learning activities. Learn how sustainability fits into the STEAM curriculum! Call the Fort Bragg Green Schools Initiative Coordinator at 432-8476 for more information! 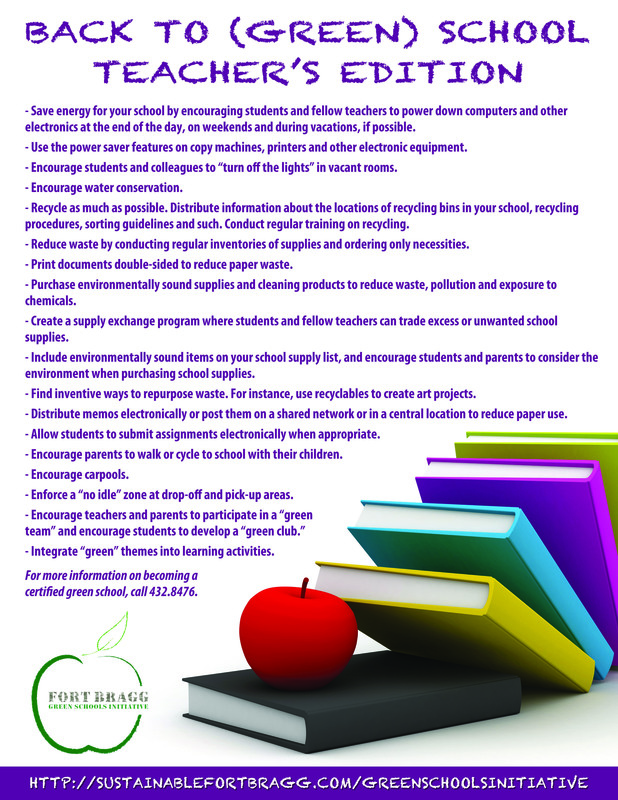 FOR INFORMATION ON BECOMING A CERTIFIED GREEN SCHOOL, VISIT THE FORT BRAGG GREEN SCHOOLS INITIATIVE PAGE.